This pot roast is so easy my kids can make it! But the best part is the amazing flavor. 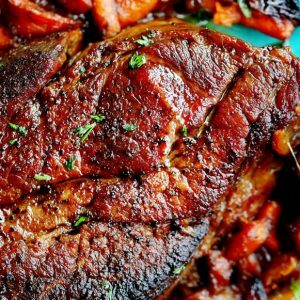 Easy Pot Roast that is also the most delicious pot roast! Take your meat out of the refrigerator at least 30 minutes before cooking and generously salt and pepper it. I put 1 tablespoon of salt in the ingredients, but you should use as much or as little as you are comfortable with. Heat a large pot or Dutch oven over medium-high heat. Then add olive oil. Cut two onions in half and add them to the hot pot, browning them on one side and then the other. Remove the onions to a plate. Add carrots to same pot and brown slightly. (about 1 minute) Remove and set on plate with onions. Add butter to pot and allow to melt. Place the meat in the pan and sear it for about a minute on both sides until it is nice and brown all over. Using sturdy tongs, remove meat and add onions and carrots back to Dutch oven. Place meat on top and cover and roast at 275°F for about 3 hours in the oven. I started checking mine at 2 hours. You want the meat to be cooked through and to tear easily with a fork.